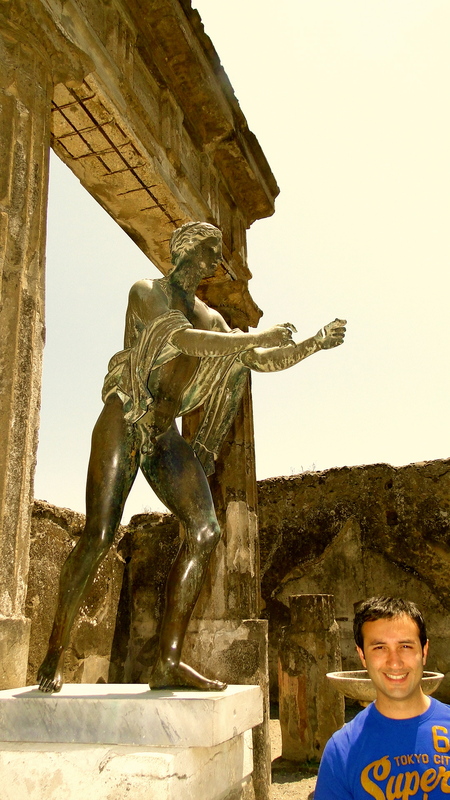 Pompeii and Vesuvius are MUST -DO Trips from Naples. 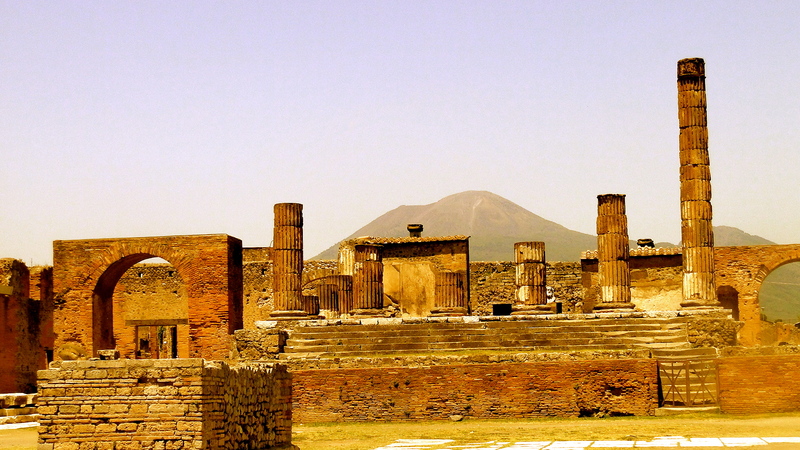 They’re not very far – Vesuvius is about 9 km from Naples and Pompeii 8 odd kms from it. The tour we booked was a small group tour on Viator and we found that Viator for the most part, gave us great deals and interesting tours! The tour started post a fabulous, filling breakfast at our beautiful hotel and soon we were on our way. We had barely 8 people on the tour and it was a small, quick bus ride to Pompeii. 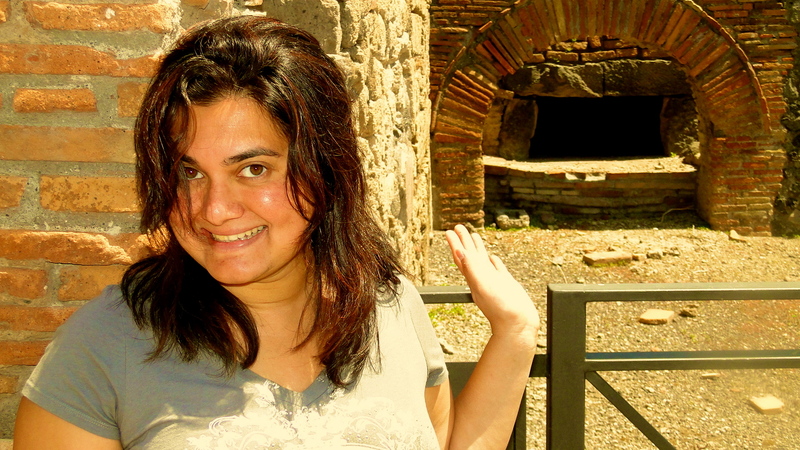 I have never been particularly interested in history but had wanted to go to Pompeii and am so glad I did. 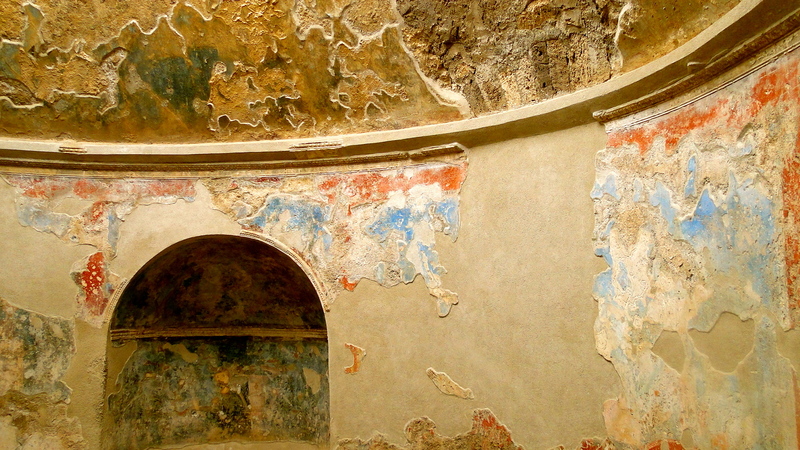 The few hours that we spent in Pompeii took me to another time. The ruins are so well preserved and the city so incredibly planned , it takes almost no imagination to transport yourself to a forgotten time and to the 7th- 6th Century BC where this city flourished and thrived! Well laid out roads , perfect shop fronts with little houses on top, schools, gladiator training areas and theatres; the planning then was infinitely better than in some of our modern cities even now! Our guide was knowledgeable and interesting and I could imagine the life of a Roman man as he came to work in the city of Pompeii. 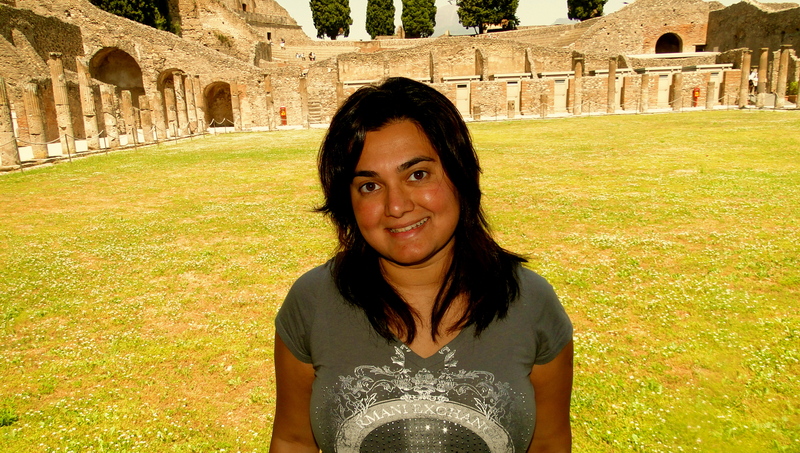 I stared in awe at the amphitheater and marveled at the Roman spa. I saw holes in the footpath where horses could be tied to ‘park’ them. The vision and foresight was incredible ! I was amazed that a pizza oven even back then looks so similar to a pizza oven now. I also loved how the roads were tilted so that water and dirt could be swept downwards. Should you need to pass there were three rocks at regular intervals for you to walk across. Shopkeepers had a store front facing the road and most lived just above their store. 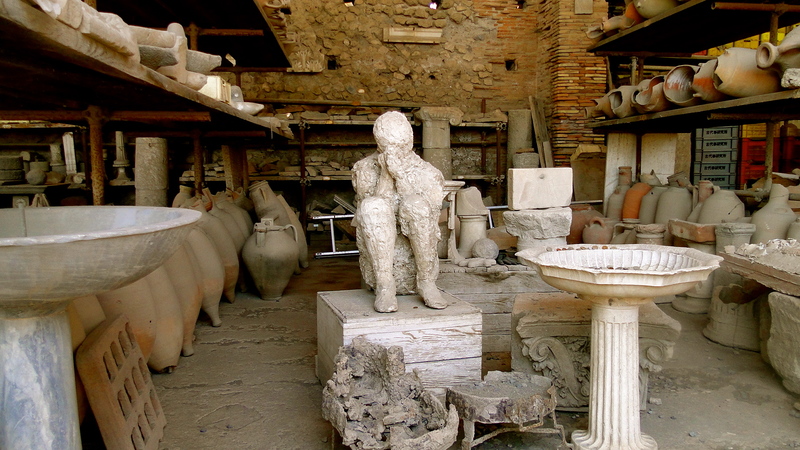 Traders and visitors would come early in the day for trade into Pompeii and after trading through the day , eat lunch in the city. Then it was time for the spa and based on your status in society you’d move to the spa meant for you. Steam rooms and sauna rooms were still preserved and because the day we traveled was a particularly sunny day- I suddenly wished to have a quick plunge myself! They also had mosaic tiles which were still there.Bright and colorful- you could see that Romans really lived life King size! Then there were also the brothels where in case you didn’t understand the language images were painted on the walls and you could choose what you’d like to do with the prostitute of your choice! An incredibly interesting time and an even more eye-opening experience for me! 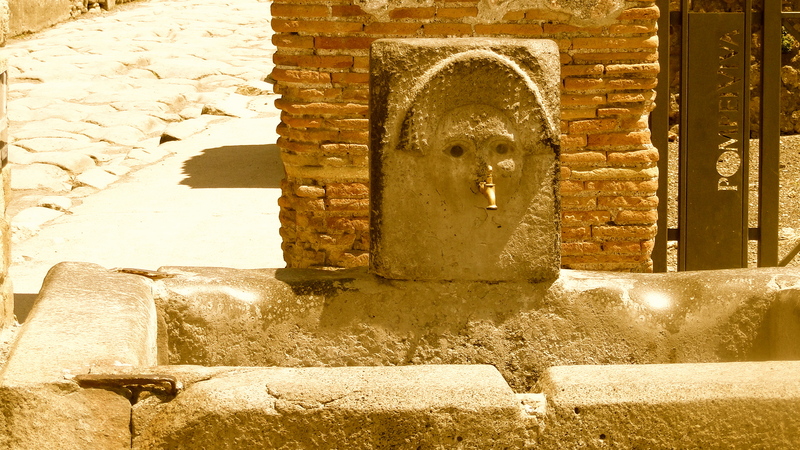 What was also really fun were the drinking water taps all carved with Gods and Goddesses with the taps becoming the mouths- they also served as road names and helped in directions for the city. 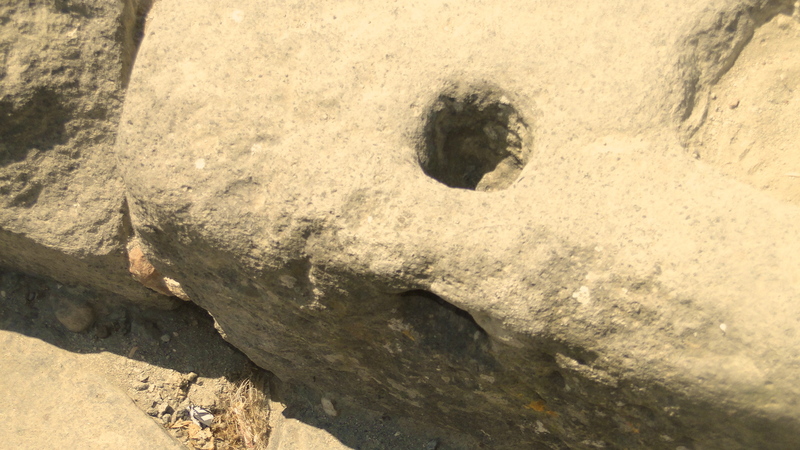 it was also interesting to see the water wells had a small indent for the left hand allowing you to drink with your right.It’salso interesting to note that the water can still be drunk and is drinkable even today! Molds of people who died during the eruption can also be seeing which gives you an idea of how truly horrible that explosion was! We saw temples and Piazzas(squares),remnants of a time once forgotten but so ahead of it’s time in planning and in structure, you couldn’t help but imagine what if? 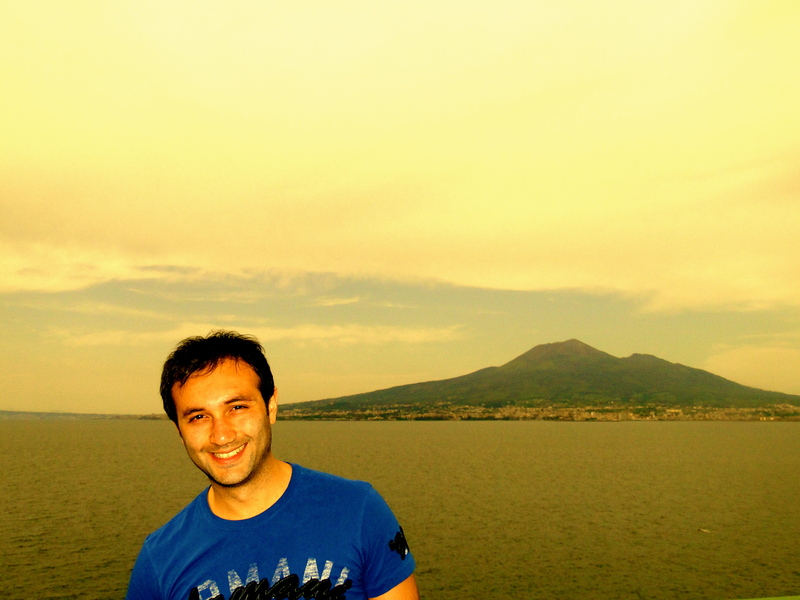 What if Vesuvius hadn’t erupted? What if the city hadn’t been lost? A tragic loss.I was privileged to have been able to gain just a little bit of insight into history. 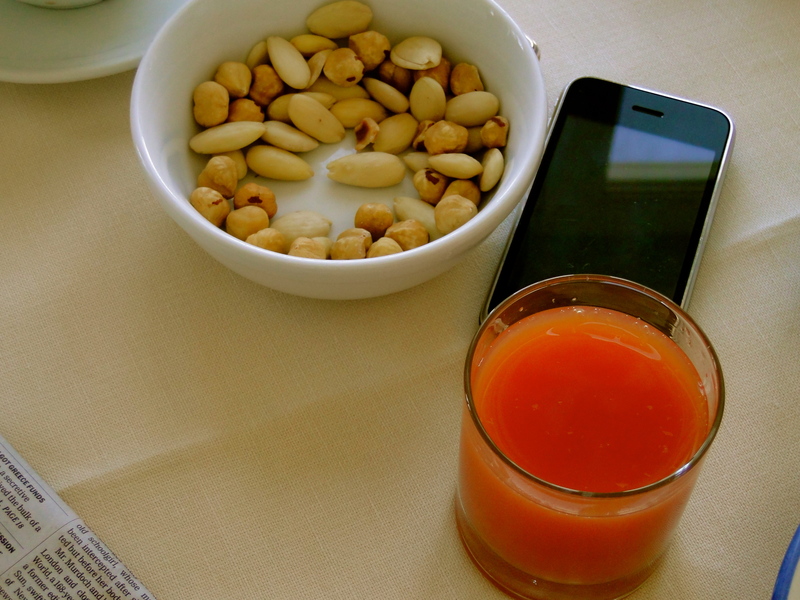 This is an absolute MUST DO on any trip to Naples! And then after a quick pizza it was off to Mount Vesuvius. Here the tour got a little less interactive. You were now advised to trek on your own and meet back in an hour. Vesuvius is an active volcano and is the only volcano on the European mainland to have erupted within the last hundred years. 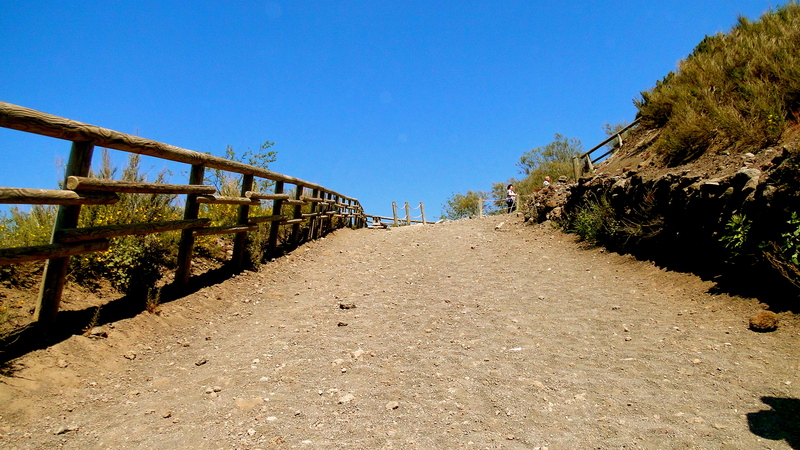 The climb is steep and the black volcanic mud makes climbing tricky. They offer sticks to help climb- take them! Even if you think you can do without them – they help you keep your footing firm. I didn’t take them- I regretted it! The climb is long with very few (almost none) stops to catch a breath. It gets hot. So wear comfortable clothes and very comfortable shoes. The walk down is also tricky because the black sand slips and moves quite a bit. 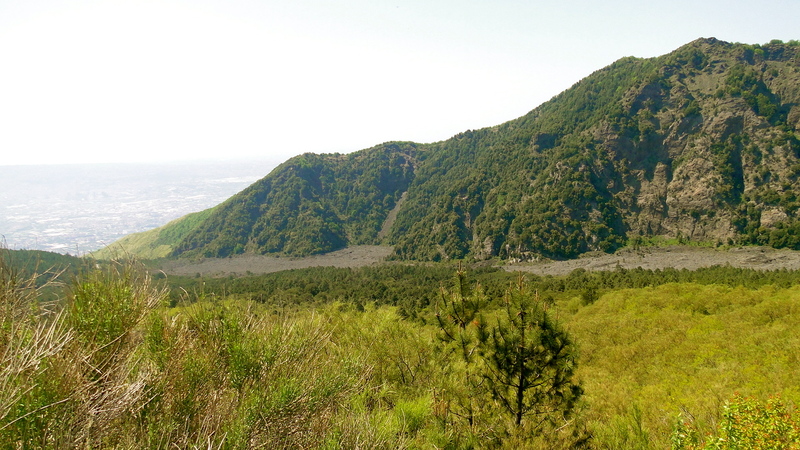 You can also see a black river of ash from Vesuvius which gives you an idea of how the ash and steam moved down from the volcano! Truly terrifying! 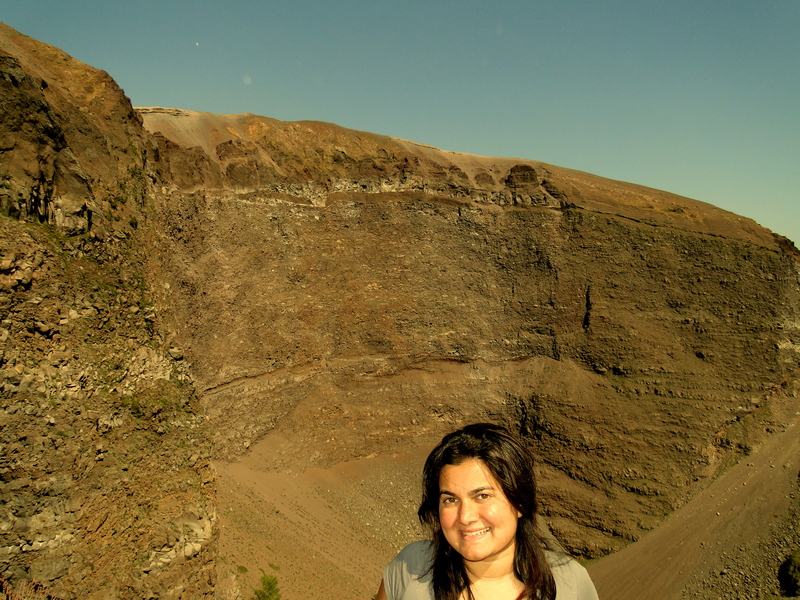 An active volcano, a lost city, a dramatic past- history came to life for me that day! Price Factor-: About $120 for the day trip! Absolutely worth it! Dress-: Comfortably with very , very comfortable shoes and carry lots of water. Best times to travel-: August to October. We arrived to Naples via the 45 minute hydrofoil (thankfully on calm seas) on a glorious sunny afternoon and checked into the exquisite, beautiful and fabulously historic Grand Hotel Vesuvio!As a Leaders Club member we were shown up to our suite immediately! The suite with its luxurious living room, oversize King bed and views of the Bay of Naples from all its rooms was a real treat! Built in 1882 the grandeur of the hotel was visible in it’s beautiful staircases, charming lifts and wonderfully large suites. 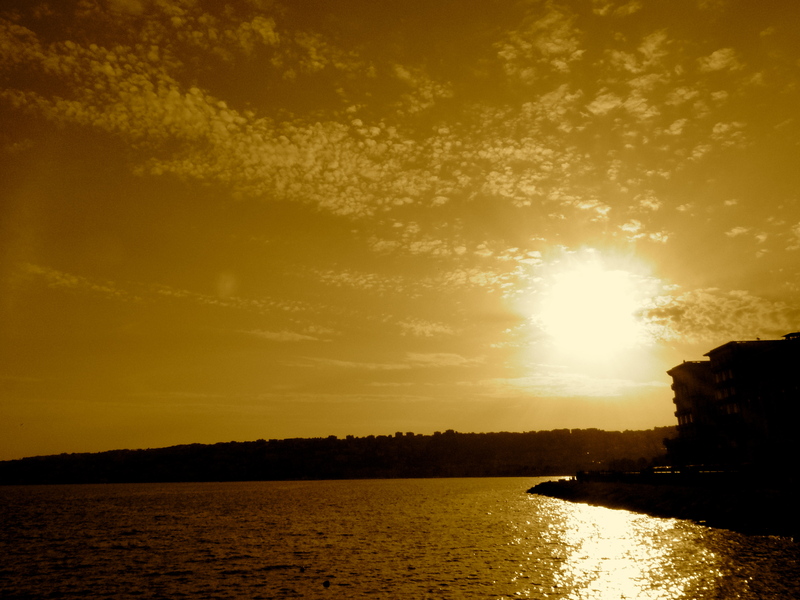 There are also some remarkable photographs of Humphrey Bogart and Grace Kelley, Woody Allen and Luciano Pavarotti to name a few that grace the walls of this charming hotel.The hotel is on the sea front as a no-car zone unless of course you are a guest and need to get dropped or picked up from the hotel. At all other times and most specially in the evenings the huge road in front of the hotel and in front of the bay is filled with children, balloons, bicycles and joggers. There are small cafes across from the hotel and they are frequented by young couples holding hands , gazing soulfully into each others eyes. But then again , living among such beauty it’s easy to fall in love again! The reason why I am talking so fondly about this hotel because it really reaffirmed a membership that I had recently acquired. Aditya and I travel alot and we decided to spend on purchasing a Leaders Club Membership from the Leading Hotels of the World. Now for all those who travel, and enjoy pampering and luxury as much as I do- this is a membership you MUST GET! The hotels are each unique, as we have found but they all have the quiet luxury, the understated opulence and the finest service. 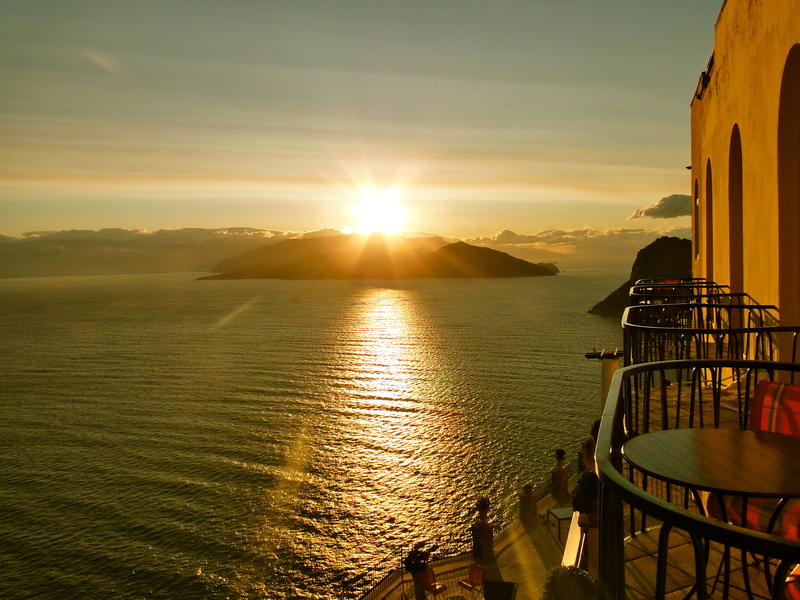 Grand Hotel Vesuvio was once again a gem that we may have missed had we not been part of the Leader’s Program. We checked in and as much as I wanted to just collapse and enjoy my fabulous room and all its wonderful amenities , it was off on the road again for the both of us. We had decided to drive to Sorrento and were both very excited! Driving the coastal roads to reach Sorrento is just beautiful. Relax, carry a duo of coffee and some munchies- stop on the way, photograph, take in Italy at its finest and enjoy the ride!It takes a little over an hour and it is one of the nicest drives ever! Once you reach Sorrento, look for parking! Parking is a major problem but there are parking structures hidden in the small lanes , so quickly find one and then enjoy this beautiful quaint town! We did coffee and dessert in Sorrento. Lively, bright, full of life and even more full of tourists, Sorrento is filled with cafes and bookstores, shops and restaurants. Walk and get lost in the hustle and bustle of vacationing folk enjoying their vacation! 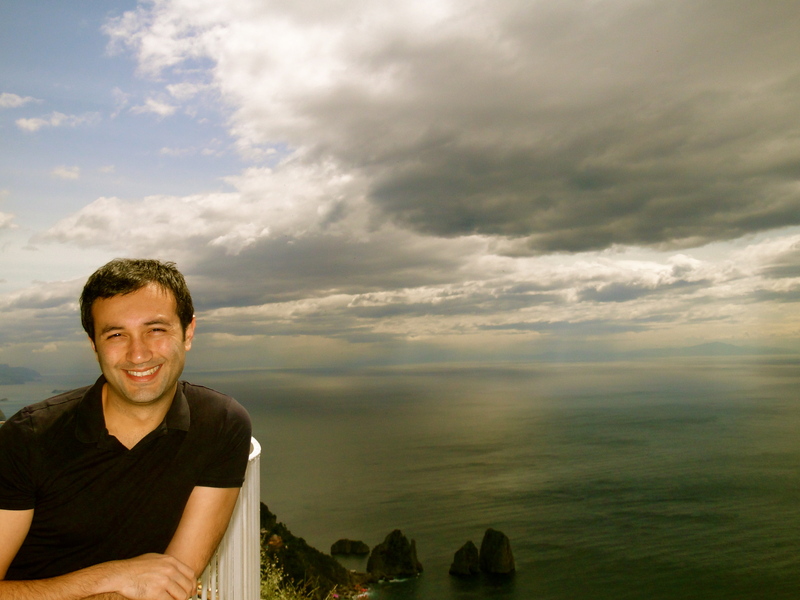 Sorrento is a perfect break on your perfect Naples vacation! Would I have spent more time in Sorrento?Well maybe lunch and the afternoon and then coffee and apertivo but would I spend the night there? Probably not. It was a lovely quaint town but it was easy to experience and to see in a few hours. If I had come to Italy just to relax , then sure I’d have spent a night but I came on a quest to see, experience and feel and i was able to take in the best of Sorrento in just a few hours and it was perfect- leaving me wanting just a bit more! Before we knew it the sun was setting and it was time for more photographs and time to get back ‘home’ and luxuriate in our jacuzzi bath tub before our tour of Pompeii and Mount Vesuvious…! More on that next week…! 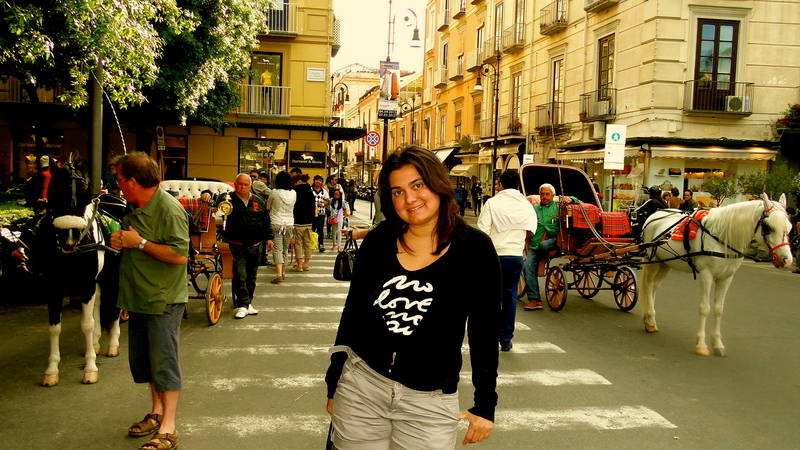 Till then let me reminisce on the gorgeousness of Naples and the sunshine-smile of Sorrento! Price Factor-: 250- 1000 Dollars a night …Naples has affordable luxury- but book smartly and book in advance! Best times to travel-: End May-September. 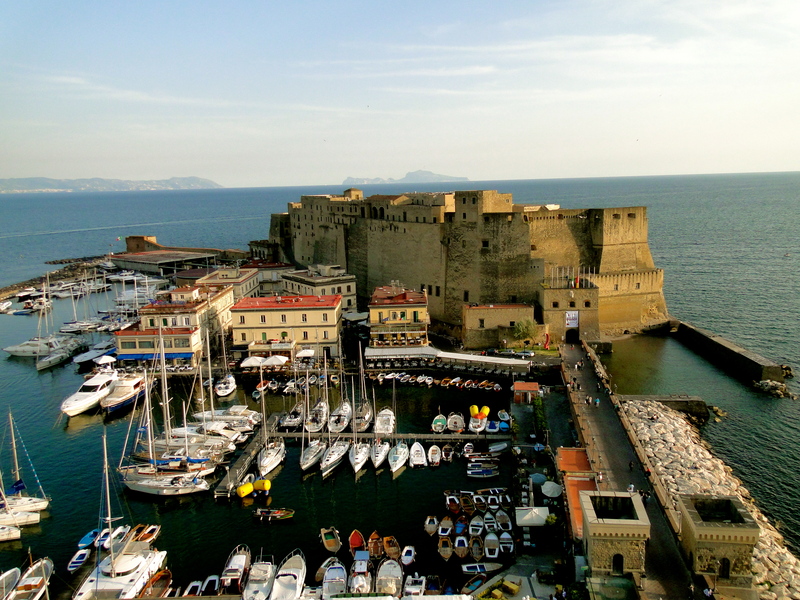 We arrived at Naples and took a taxi to the port which is about 5-10 minutes away. There we bought tickets to the hydrofoil and boarded.There are regular hydrofoils to and fro from the island. they are large boats seating approximately 300 odd passengers and take 45 minutes to get to one side. The sea was incredibly rough and the boat incredibly large and unwieldy and unfortunately our ride to Capri was filled with passengers with green faces, some throwing up, most about to and lots of screams and shouts! It is a 45 minute boat ride and as much as I love the water I couldn’t wait to be back on land again! And what a beautiful land. 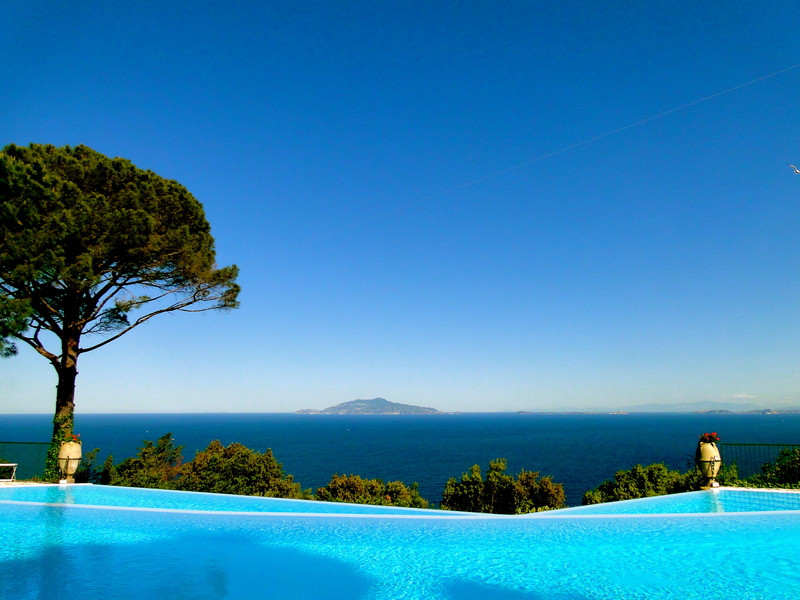 When you arrive in Capri, you are stunned by the bluest of blue waters, picture perfect views and the most glorious bay! A car from the hotel picked us up and in minutes the boat trip was forgotten and we were on our way to Anacapri. 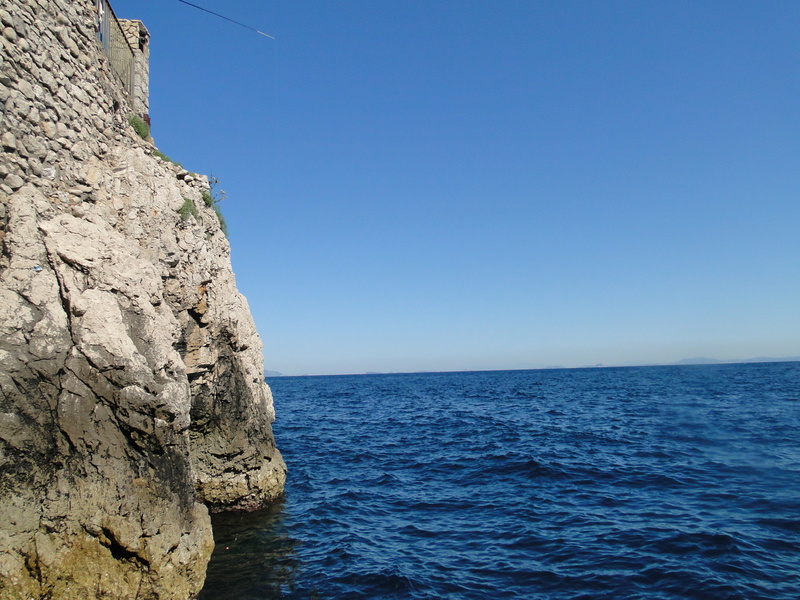 Ana means higher and so this is a point higher than Capri and looks over Capri and the bay. The hotel we had chosen had was on a 1000 foot cliff edge with stunning views of Mount Vesuvious and the island and was the winner of 2012 Best European Hotel. It was called Hotel Caesar Augustus. The winner of numerous travel and luxury awards, this was the hotel I was most looking forward to! The hotel was beautiful- personal, private and with the most stunning views of the bay and of Mount Vesuvious. It seemed like a home converted into a luxury hotel and soon enough we met the owners who still actively run the hotel! We were shown to our suite and were enthralled by the balcony which had yet another spectacular room! The day was windy unfortunately and the sea was rough and cold so after our long trip over there was little left to do but to laze in the hotel and completely relax! The hotel was stunning but very unlike the other 2 Australian Relais and Chateaux that we have stayed at (Qualia and Saffire Freycinet) the rooms though comfortable were rather tiny and the hotel, though beautifully placed was more of a fabulous home with a warm homely feel as compared to these 2 properties which were luxury at it’s finest. Personally I love staying at the Leading Hotels of the World because you always know what to expect- an old world charm, a historical beauty and the finest of service. I was hoping that Relais and Chateaux would also have a certain common ground with their choices but though all the hotels are beautiful, I much preferred the space and professionalism that the Australian Hotels offered. When I travel, I don’t want to go to a home, no matter how beautiful it is. I’d like to stay in a hotel. A ten minute walk from the hotel is Piazza Vittoria and a chair lift which takes you to the highest point on the island. This is definitely a ride worth taking! It takes about 15 minutes up wards and 15 minutes down and will give you some of the most incredible photographs you will ever take. 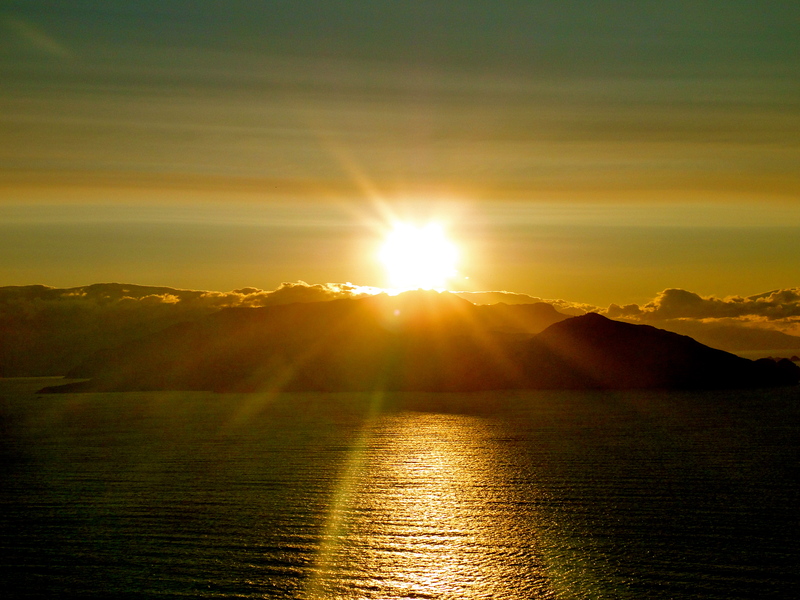 Have a warm Irish Coffee as you reach the top and be mesmerized by the sheer beauty of the island! Spend a little time in the shops at Piazza Vittoria. Very reminiscent of Santorini for me, these small shops and cafes are stocked with local paintings, bright prints and fun gifts to take home! Don’t forget to eat a gelato while walking the white pebbled roads. This is a great place to while away an hour or so! 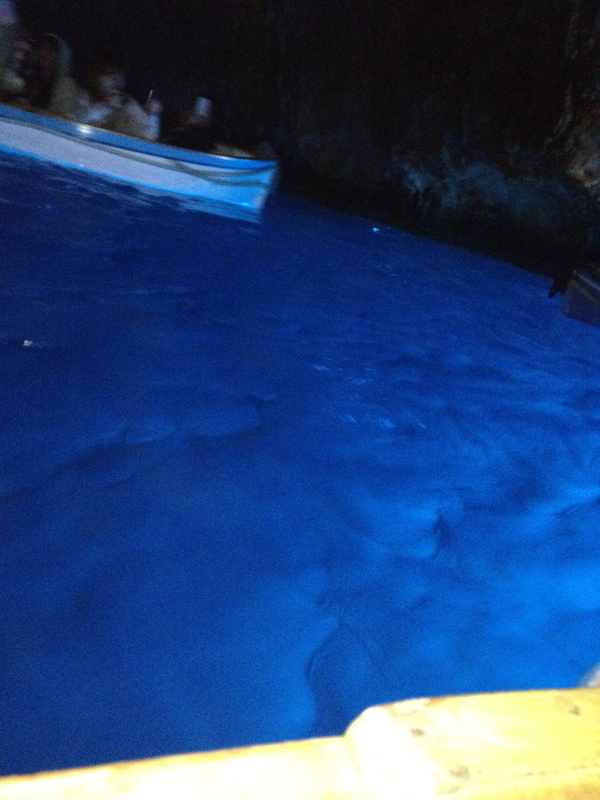 A tour of the Blue Grotto or the Grotto Azzura. The Blue grotto is so called because it is a cave with a very small opening with allows just enough light to illuminate the water such that the entire cave is lit up in the most brilliant of blues. Now the Blue Grotto is often shut based on the wind and water issues of any particular day and for our short trip it was closed because of a sudden dip in temperature accompanied by storm winds. However on our last day as we headed towards the hydrofoil we met the ‘President’ of the Blue Grotto who informed us that it was now open! Aditya and I ran to find a boat that would take us to the Blue Grotto and in minutes we were on our way!Once you reach the Grotto however, it is a wait for at least an hour as you must disembark from the boat you are in and move into a small , low boat which holds no more than 3-4 people. 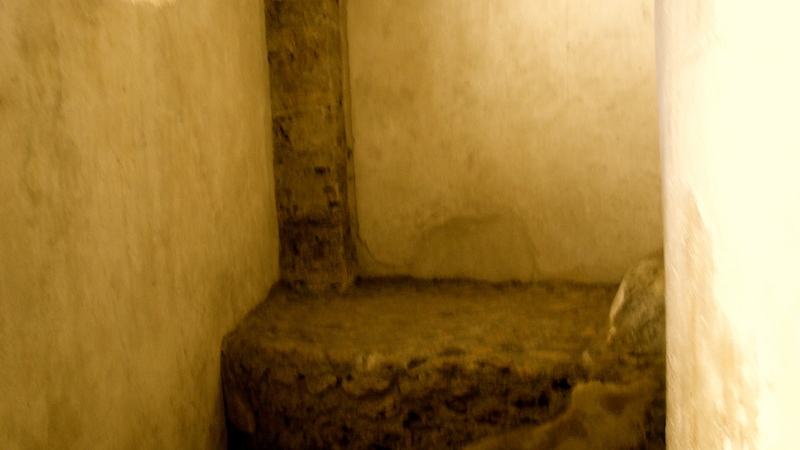 Then you must lie flat as you enter else you’ll be hit pretty badly on the head as you enter the grotto . And once you are in, you realise the wait was worth it. 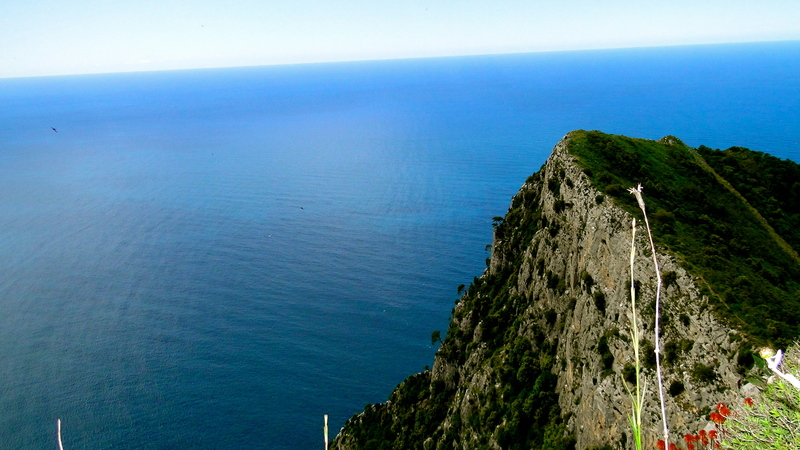 Bright blue, radiant and completely unique- this is a MUST DO on any trip to Capri! Capri was my break in an otherwise super packed Italian Tour, it was beautiful, unexpected and relaxing. Should you stop in Capri overnight….definitely – to relax, to unwind, to breathe and to do this Sapphire Beauty justice- stop over , relax and SEE the BLUE GROTTO! Price Factor-: Expensive ! 400-600 Dollars a night …but can you put a price on complete relaxation. Best times to travel-: End May-September. As it approaches June , the weather gets less unpredictable and a lot warmer….so if you’re traveling in May opt for the last few weeks! Living, loving and breathing Milan! 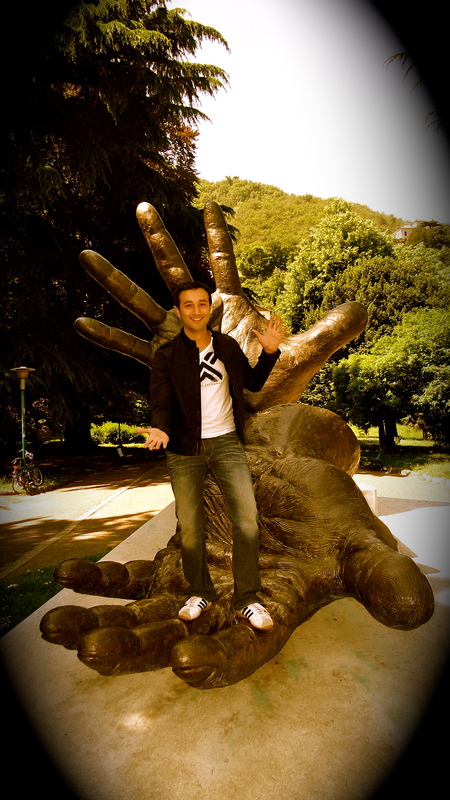 Italy has always been on my MUST-VISIT list of destinations! I added it to my ‘Oprah-Visualisation Chart’ and romanticized it, dreamt of it, read about the hotels and the language and so when we finally decided to go to Italy- I was really, really excited! now I must confess, I always wanted to go to Rome and Venice ! They seemed glorious and romantic and that for me would’ve completed my Italian experience !Or so I thought! I was so wrong! I was able to schedule some work finally in Italy and schedule some meetings and theatre performances and this May was finally my chance to see Italy. Luckily my partner in crime, Aditya convinced me to see the whole country- from North to South …”Let’s really explore 1 country fully,” he said! 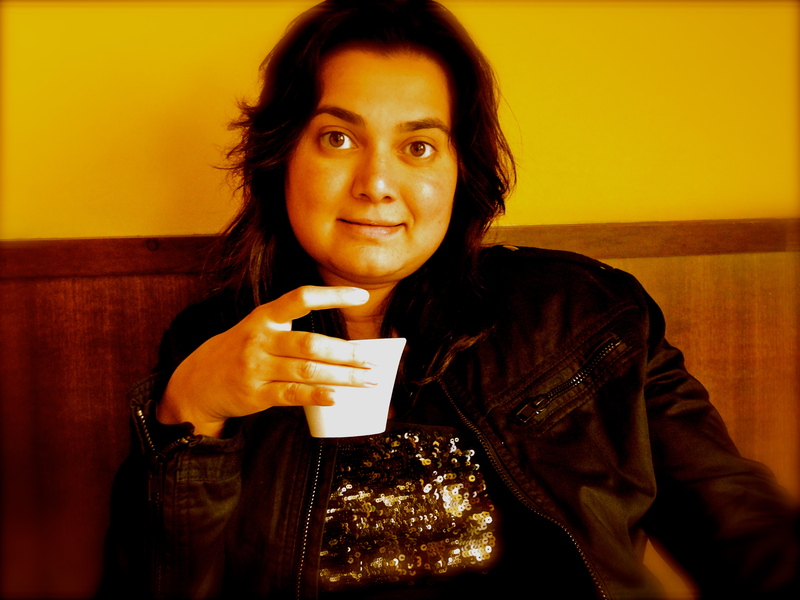 And the excitement of doing the Multi city Euro Trip that I had longed to do since college but had never done took over and before we knew it we were off on ADITYA & DIVYA’S EURO TRIP 2012!!!! It was going to be fabulous! And by God it was! We arrived in Milan. 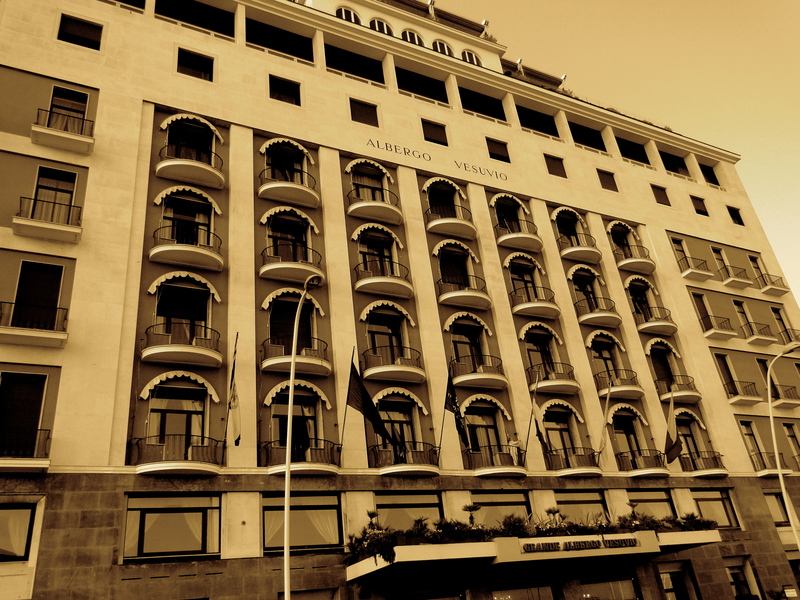 We were staying at the glorious Grand Hotel et de Milan, a part of the Leading hotels of the World in Montenapoleone – the heart of the fashionable district of what is arguably the most fashionable city in the world and a stones throw away from the glorious Duomo. 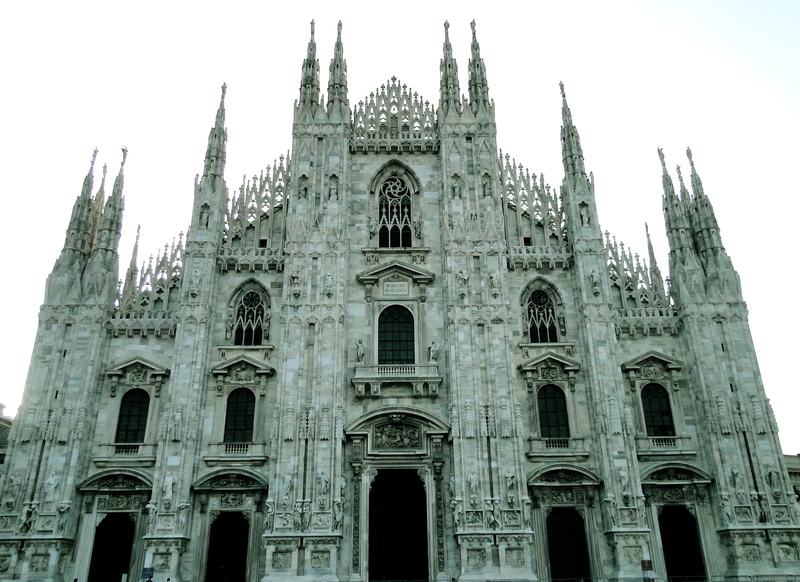 Now the Duomo is a Cathedral and you will see many in Italy though none as glorious as the one in Milan. We arrived late in the evening at 5 p.m. and it took us 45 mins or so from Malpensa Airport to our hotel. The scenery changed from stark, to more modern and then to glorious , old heritage buildings and I was delighted to see our hotel was one of these fabulous, fashionable structures! The hotel was beautiful, preserved and luxurious. We were quickly shown up to our suites and in true-blue Euro Luxury Trip fashion, we washed up and headed off to explore this gorgeous , fashionable city! The hotel is walking distance from the Duomo so we decided to bundle up( it was pretty chilly) and walk to the Duomo. To get to the Duomo from our hotel, you walk by the historical Teatro alla Scala which had people getting out of their cars to see the Opera. I couldn’t believe we were so close to such incredible history. And then we saw it…the magnificent Galleria Vittorio Emanuele II a beautiful double arcade in the connecting Piazza del Duomo to Piazza della Scala. Piazzas are squares and the one in front of the Teatro alla Scala was naturally the Piazza della Scala. It joined the Duomo square. We walked through this magnificent, bustling arcade on a Sunday evening and witnessed sheer perfection- the Duomo! The square was being used to host a concert and people was sipping coffees and listening to beautiful music while basking in the splendor of the sun setting over the Duomo. This was my definition of the perfect life! We ordered a pizza (I HAD TO!) and a cappuccino and relaxed in the glory of a beautiful, musical and mellow Milan. 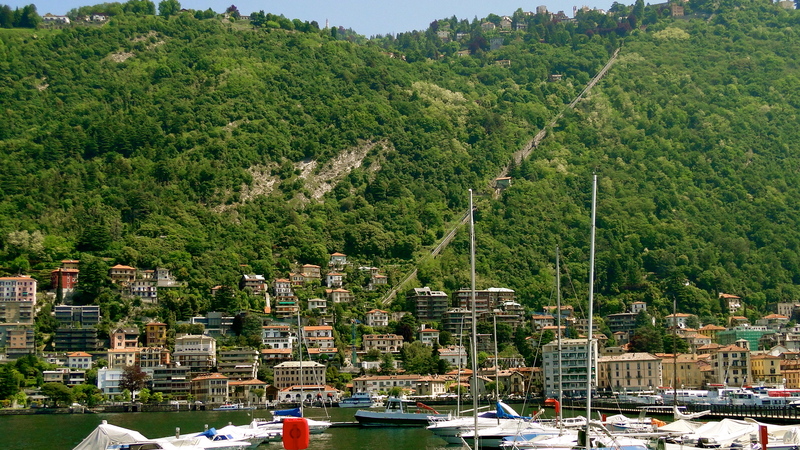 It was off to Lake Como the next day and the train tickets had been booked! The Milan train station is sensational. Milano Centrale , the central train station is a heritage building , has hundreds of trains coming in and thousands of passengers but also has shops like Armani Jeans, Zara, Guess, Berhka, Desigual…to name a few! Guess fashion starts in Milan as you arrive!! !We arrived a bit early to the train station as it was our first train of this trip and got so caught up with the shopping, we’re lucky we made it in time at all! Lake Como is 33 minutes by train and can obviously be driven to as well, but being that we had just arrived we didn’t really want to start driving so soon! Lake Como is picturesque, calm and beautiful. It’s a wonderful place to grab lunch or coffee and just let life pass you by! You can walk to the lake from the train station and walk up to some lovely cafes by the edge of the lake and have a truly beautiful and memorable afternoon! The two hands installation was a photo op for every person who seemed to pass the wonderful park on the way to the lake! But I needed to go back! 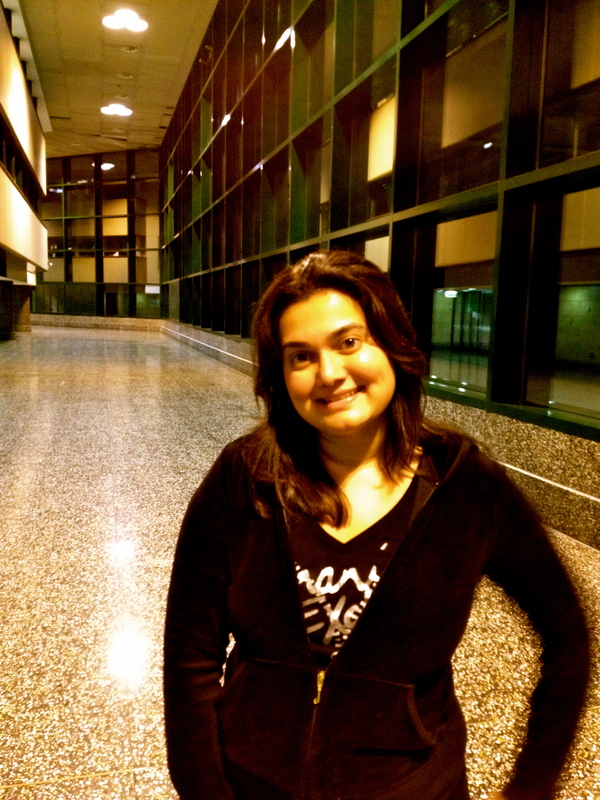 I’d fallen in love with Milan and I wanted to explore! So off we went- back to explore and back to shop! I had a couple of meetings with actors and performers and some work with Creative directors and then it was back to walking the city ! The shopping is fabulous! I bought my first Giorgio Armani and I loved the Armani store and I loved the chic boutiques with fabulously coloured beautifully ,draped clothes! I shopped till my soles wore out and then bought new shoes! After that we did Apertivos at the uber stylish D&G Store. Apertivo is something that happens thru all of Italy! Genrally Apertivo happens between 7 and 9 p.m. and roughly translated ‘Apertivo’ means a pre-dinner drink, meant to “open” the palate. It gives you a chance to relax, and nibble on some wonderful tapas as dinner is approaching. the tapas in each restaurant is different and you get a selection as you order a drink! And truly it is one of the most beautiful ways to unwind! We connected, talked, planned and laughed as the sun set on a busy yet thoroughly enjoyable day! 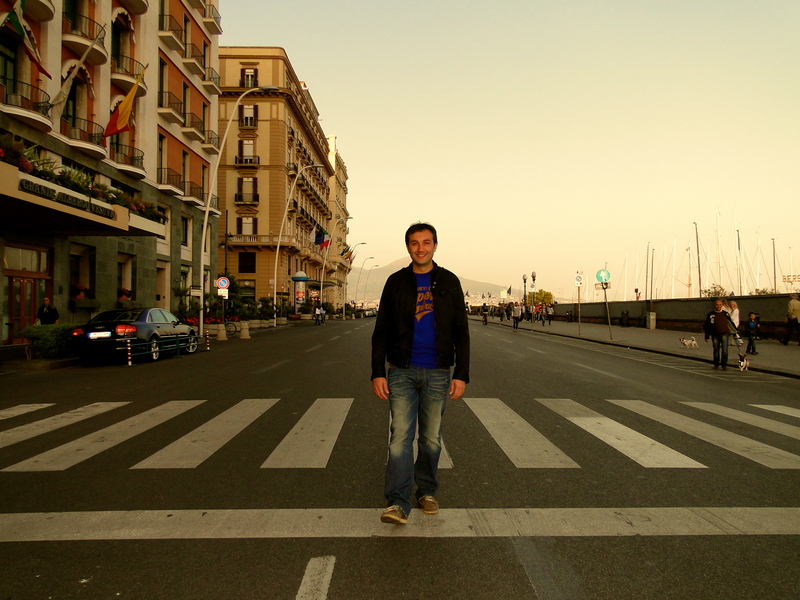 And the next day we opted for a walking tour of Italy. Walking from the Duomo, we listened to it;s history and sensed the excitement in our Guide’s voice as she talked about the impending Papal visit later this year. We walked down the Galleria to the Scala square where we posed in from the Leonardo da Vinci statue and listened to the guide wax eloquent about the operas at the Scala theatre. From there we walked to the Castlello Sforzeco which had children playing in the gardens, families walking and enjoying the history and tourists like us capturing some unforgettable images! We also saw a poplar tree! Now this is important because whenever I walked in Milan I’d see this white , cotton wooly substance floating in the air. 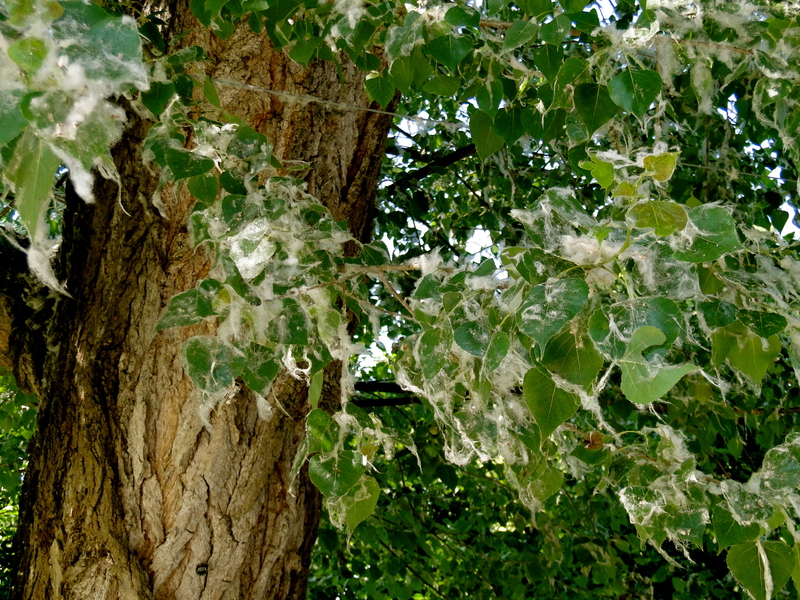 at first I assumed it to be dandelions but when seeing this tree I was informed that the tree was the cause for this white billowy substance! Go to Milan , you’ll see what I’m talking about! And then we walked to our final stop – to see the piece-de-resistance – The Last Supper painted by Leonardo da Vinci. Now, I had no idea what i was to expect.I assumed it to be small, preserved, protected and was sure I’d have to push thru crowds to barely get a glimpse of it. But I was wrong. The painting is 15 feet × 29 ft (so huge!!!) 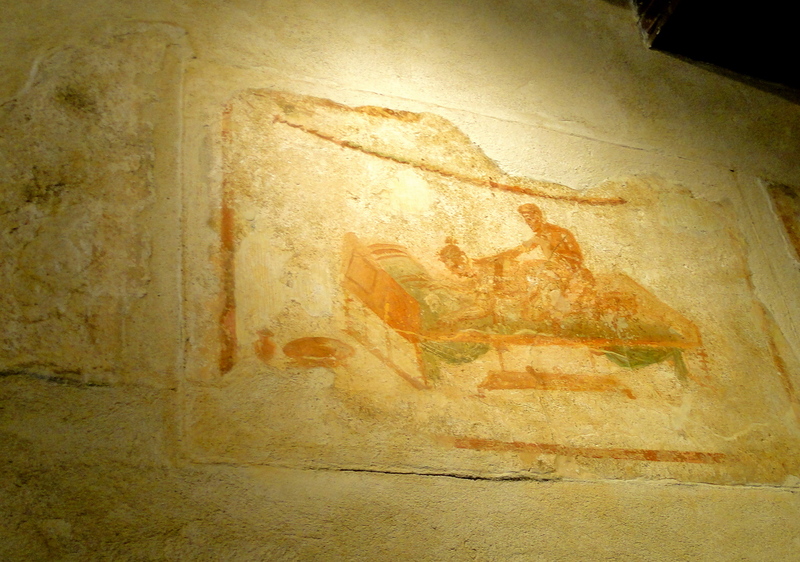 and covers an entire wall of the dining hall at the monastery of Santa Maria delle Grazie. They only allow about 30 people into the room at a time and you can sit or stand any where…You just can’t miss it! It is spectacular! I prayed fervently in the church and have a slight feeling God was right there listening…and then it was off via tram to Duomo square , some more incredible shopping and a quick change of outfit at our hotel! And then like a fashionable Milanese we strutted to the Bvlgari hotel for Apertivo and then topped off this delicious day with the most tasty sushi I have ever eaten at Nobu! A coffee at one of the oldest cafes in Milan The Caffè Cova – a wonderfully quaint pasticcerie founded in 1817. 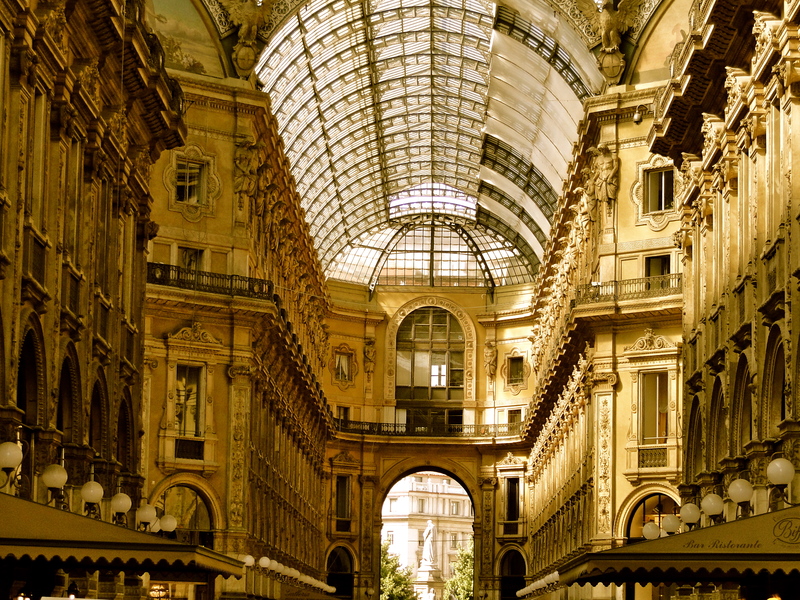 A walking tour of Milan…that truly is the best way to see the city! See the painting of the Last Supper. 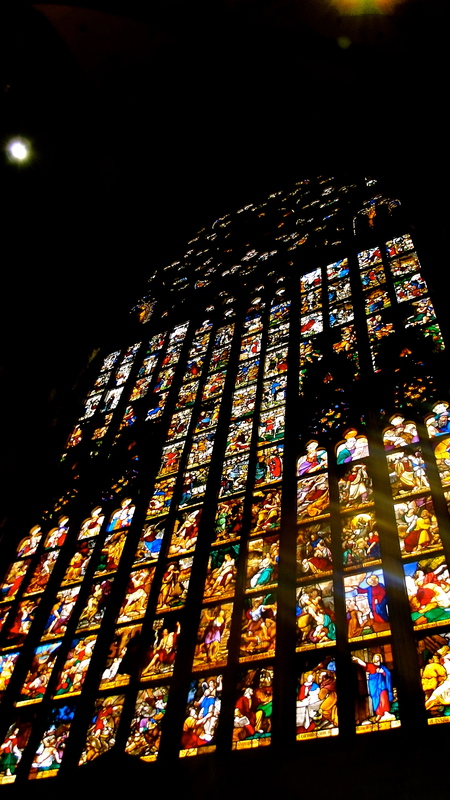 See Leornado da Vinci’s masterpiece with all it’s secrets and stories and be mesmerized! Splurge on shopping ! The Italian designers are more reasonable in Milan and the clothes don’t get cut better than here! Do an Apertivo or do a few apertivos! Travel the city. Scour the tastiest tapas and the most beautiful restaurants and enjoy the evening like the Italians do! Fabulous fashion, incredible beauty and truly delicious- Milan was easily the most glorious city I have ever been to! She is a beautiful lady – fun , flirty, feminine and delightful- not in any way the industrial , boring city it’s described to be. It was by far the perfect start to a legendary trip! Price Factor-: Expensive ! 500-800 Dollars a night , make sure you get something close to the Duomo and the Fashion District! 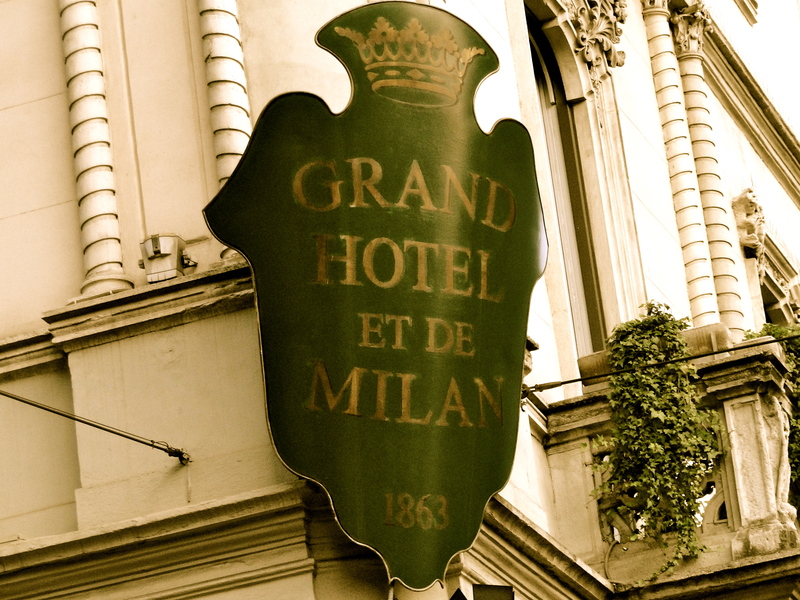 My recommendations are Grand Hotel et de Milan and the beautiful Bvlgari Hotel! Best times to travel-: May-September but remember as holiday season hits abroad (May end) expect the city to be filled with tourists. We went in the second week of May and tho there were some tourists , it was still largely empty, local and a lot more fun!